Patricia Bage's Beginner's Guide to Drawn Thread Embroidery features four projects you can make from start to finish, including the Summer Garden, Roses and Lace, Flower Garland and Rosebud Trellis with several designs shown in more than one colorway. The designs range from classic band samplers in both white and colored threads, as well as finished items such as keepsake box lids and delicate, lacy cushions. Each exquisite project combines traditional counted embroidery techniques with contemporary embroidery threads and fibers, colors and decorative embellishments worked on even weave fabric. The author includes everything you need to get started with embroidery, including general directions, embroidery stitch diagrams, thread and fabric recommendations and of course, directions for marking, pulling and re-weaving threads in the fabric, and cutting banded sections. The basic stitches featured are used repeatedly throughout the book - learn the stitches once, and then put them to use in different ways. Basic drawn thread embroidery stitches used to create the lacy open areas and delicate-stitched bands include a wide variety of the hemstitch and ladder stitches, herringbone stitches, coral stitch and French knots, cross stitch, cluster stitches and woven wheels, and beadwork techniques as well as basic embroidery stitches including backstitch, running and double running stitch. Basic drawn pulled thread stitches such as the four-sided stitch or three-sided stitch. 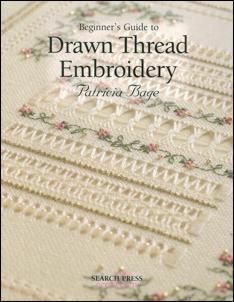 This book is perfect for anyone wanting to learn the basic techniques involved in the drawn thread or pulled thread embroidery (including some stitches common to Hardanger) while working on an actual project. There are four to choose from, and each design allows you to master the basic skills necessary for this type of embroidery. In addition to excellent stitch diagrams, the author includes clear color photos showing the actual steps involved in working each stitch, making learning the techniques nearly foolproof. Create beautiful drawn-thread embroideries with this handy guide filled with vintage and contemporary designs. Step-by-step directions are accompanied by illustrative photographs and instructions covering fundamental techniques and stitches. Four projects structured to build familiarity with more complicated patterns are also included. This is a valuable resource for practiced embroiderers or quilters looking to expand their repertoire. Patricia Bage has studied and taught a wide variety of needlework techniques throughout her life and is the founder and operator of Patricia-Ann Designs. Her company has been specializing in providing drawn thread, cross-stitch, and specialty-stitch products, books and kits since March of 2000. She earned a BTEC Professional Development Award in Design at the Kent Institute of Art and Design and resides in Great Britain.